b.o.s. 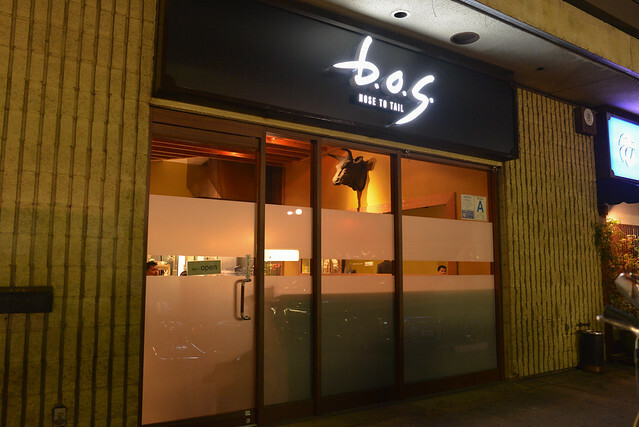 is one of the newest restaurants to open in the Little Tokyo area. Inside the Honda Plaza next to the ever-popular Sushi Gen (and across the way from Men Oh Tokushima), the restaurant has a rather unique focus: beef nose-to-tail dining. 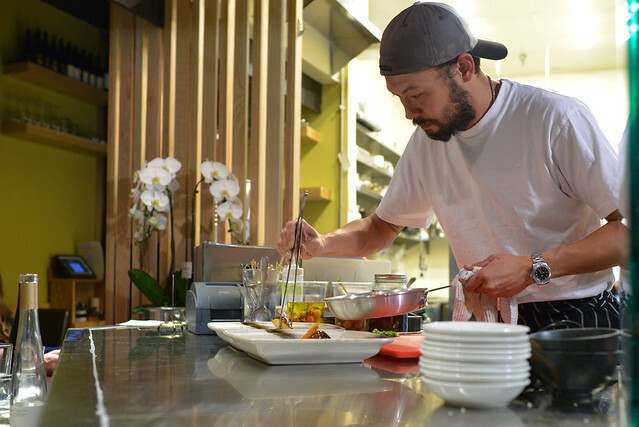 Mainstream diners have become more engaged in this concept and I think Little Tokyo is an ideal location for a somewhat upscale opening of this type. 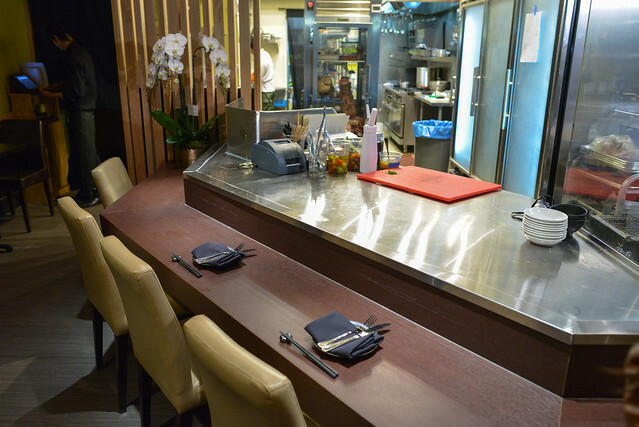 Like most restaurants in Little Tokyo, it’s a small place with the prime seats being a six-seat chef’s counter looking into the kitchen. Chef David Bartnes is the point-man behind the counter; having spent much of his life traveling around the world, Bartnes combines these worldly influences (primarily Asian) with his classical cooking background. 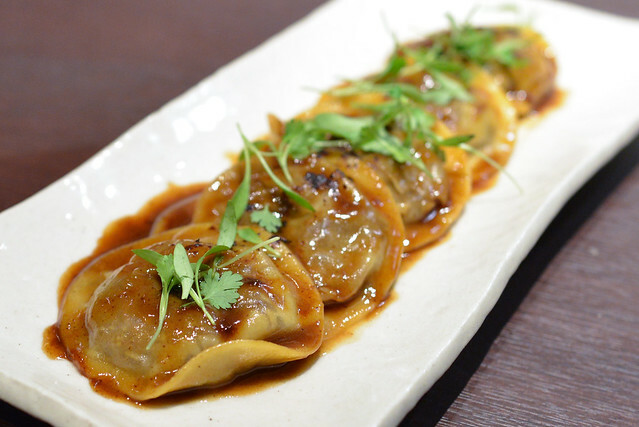 The resulting fare is an interesting mix of flavors that change frequently but could include an oxtail ravioli, beef cheek risotto, tongue carpaccio, grilled heart or roasted bone marrow. Both an omakase and an a la carte menu is available; on this first visit, we sat at the chef’s counter and had the 5-course omakase ($55). Tender with a slightly smoky, crispy exterior, I enjoyed this amuse bouche (a rare departure from the beef-centric menu). 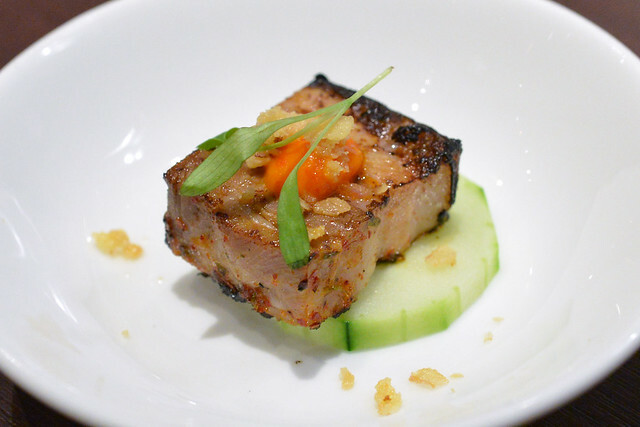 A hint of Thai spice and sambal brought the depth of flavor, countered by a slice of cool cucumber. Loved the colors – definitely a promising start. 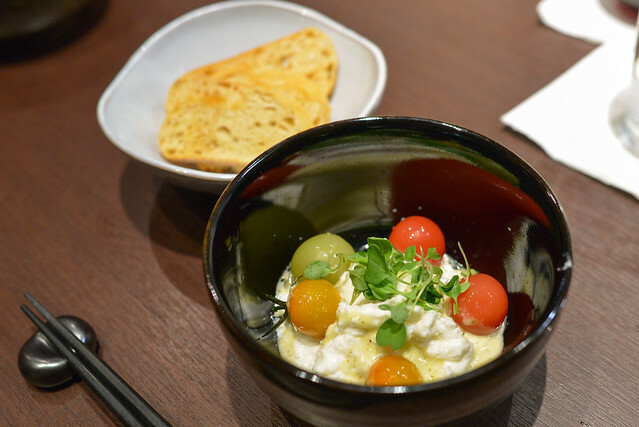 Juicy sweet cherry tomatoes were paired with burrata, which seemed to be aerated in a way. Definitely lighter than most burrata I’ve had. Lime and cilantro provided acid and another flavor profile, respectively. Not as memorable as the rest of the dishes, but a lighter way to move into what was a fairly rich meal. 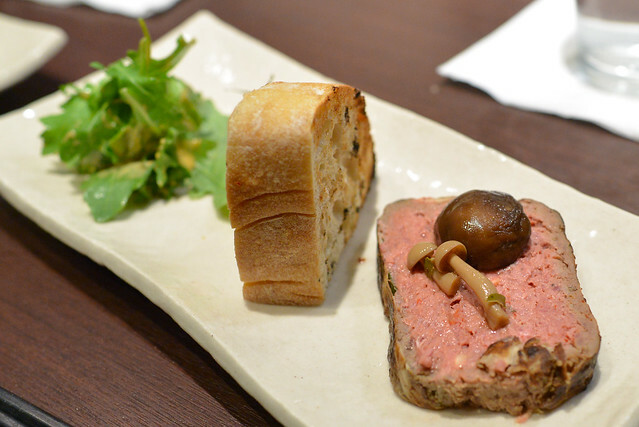 The terrine showed off a strong beefy flavor and a rich minerality. Nice. The side salad provided acidity to offset the richness, while arugula added its characteristic peppery bite. 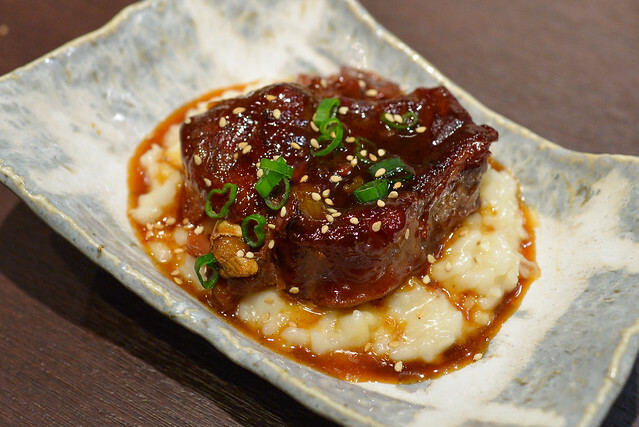 This was a very rich dish, centered around this fork-tender glazed shank. Subtly sweet and very savory. There was a lot of depth with ginger and other Asian accents, paired with a risotto which had a nice chew to it. 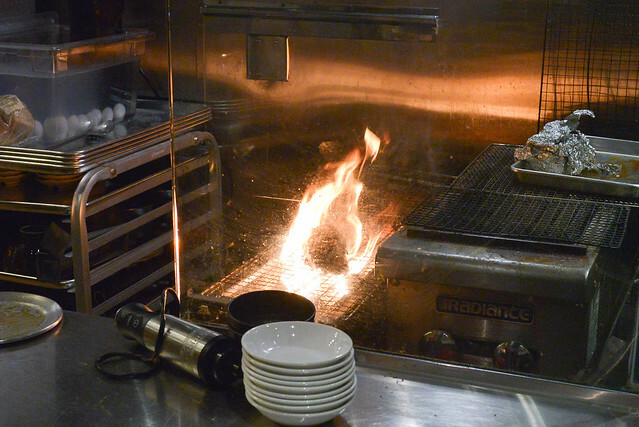 This was an add-on to the omakase; I’d previously seen a picture and really wanted to try it. The pasta was very thin and stuffed to the brim with oxtail. A rich demi-glace provided additional meatiness to each savory bite. 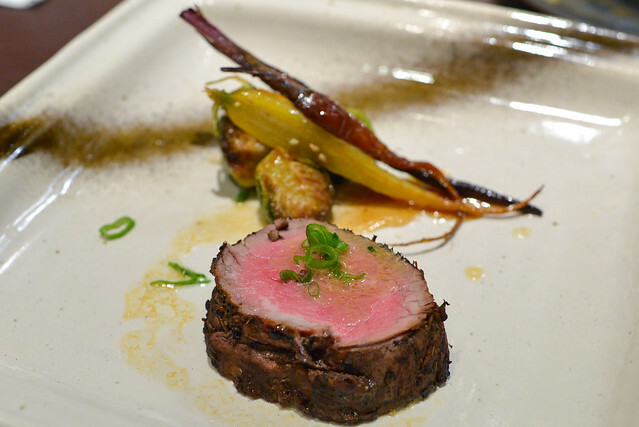 I was a little surprised to see a filet here, though of course it’s within the nose-to-tail parameters. It was cooked well with an imbued smokiness but naturally just wasn’t the most flavorful cut of beef. Given the savory depth displayed in the previous dishes, this one just wasn’t as memorable. The meal concluded with a rich panna cotta – semi sweet, semi tart. Orange segments, marinated in fall spices, added some fresh flavor. 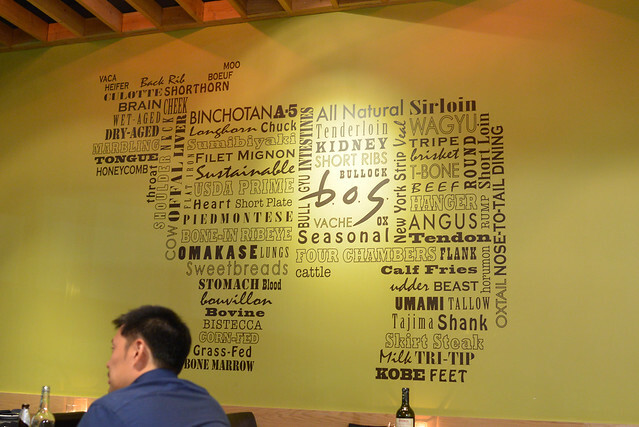 I enjoyed the meal at b.o.s. finding it, for the most part, well-executed and pretty tasty. With the $55 omakase we left stuffed (it was both a large quantity and generally heavier dishes), I may opt for a la carte next time. Chef Bartnes’ world travels definitely were on display and I just found the food to be very interesting. In my opinion, this is one of the more intriguing openings in Little Tokyo and I’ll definitely return.